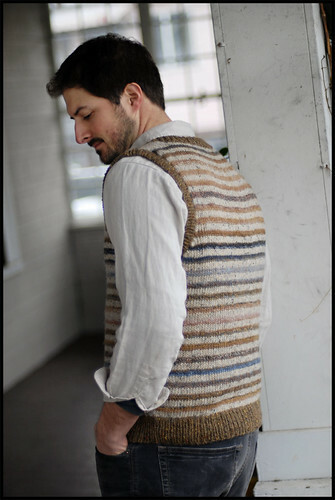 I knit this vest last spring - it was a bona fide Frankenstein of harvested tweed from recycled thriftstore sweater wool and a gaggle of handspun Shetland that I had no idea what to do with. 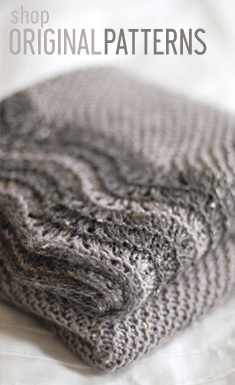 It's gotten a lot of wear this year and the folks at Wild Fibers Magazine asked me if I'd write up the pattern for their 5th Anniversary Issue - which I was happy to do! I took the vest along on my trip to Portland over the holidays for a proper photo shoot and formal pattern-writing session. Alberta is named after the PDX neighborhood of the same name - the place I call home whenever in Portland. The pattern [Ravelry Link] is written for worsted weight wool - 4.5 stitches to the inch - with no suggested retail yarn, due to the whole Frankenstein thing I mentioned above. I'd love to see what other juicy wools others knit this up in! The vest is steeked (see the gorey details here & here) for both armholes and neck opening, which means no purling! And also fast knitting - this one just flew off the needles back in May. As a heads up, a few typos squeaked their way past both me and the tech editor - I've listed the changes at the bottom of the post as well as on the pattern page on Ravelry. My apologies for this! I'm off to Tampa for 5 days (my first time to Florida. Ever.) - and looking forward to a little sunshine! The most important item on my immediate agenda is the same one we all face the night before a flight: what knitting to bring and how much! As a rule I tend to bring more than I need - carrying an extra project is so worth the alternative - running out of knitting while away from home! Now that's a tragedy! Take a drive to Sarasota for the most beautiful beach on Siesta Key. I-75 South to Exit 205 - follow for about 5 or 6 miles, finally crossing Route 41. Continue over the bridge onto Siesta Key. Go right at the end of the road and follow Midnight Pass Road (bear left at the fork- Fire Station)) and the beach is on your left. White sand as soft as ever. You'll love it! That is lovely - I especially love the name, as I call the Alberta area my home as well :) Well, as soon as get back to PDX next month! I am in love with stripes right now, and your vest affirms my obsession. it looks great! Have a wonderful trip! I wish I could leave this chilly city for a week or two! While in Tampa you MUST visit the Dali Museum... even if you aren't a fan of him (as I wasn't), go anyway, it's amazing and I have a much better appreciation of him now. Enjoy! ps, the vest is lovely! I love the sweater... and must say, I am impressed by the Frankenstein-ness of it. Well done! 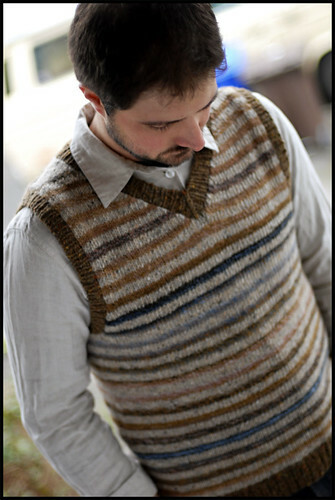 I am currently making what I hope to be similar to this vest using Noro Silk Garden and Sublime Cashmere Merino Silk Aran. 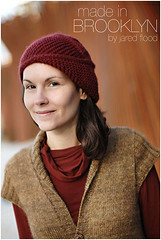 My husband is not really into knitwear but he really liked this vest... We'll have to see how it turns out! Gorgeous and practical! Another winner! I just caught your article in the current Vogue Knitting... Congrats! I really enjoyed it...especially since I have read your blog for a while now and have been keeping up on your knitting projects. I hope your knitting passion/career takes off for you. all the ladies must smile when they see you knitting away on the plane! Congratulations on the great feature story (and beautiful glove pattern) in the new Vogue "Knitting." And on your meteoric rise to fame! As usual, your talents are a marvel. Some day, I hope to create such lovely creations! they have an entire room dedicated to Noro. Love the look of this vest. It's classic and classy. 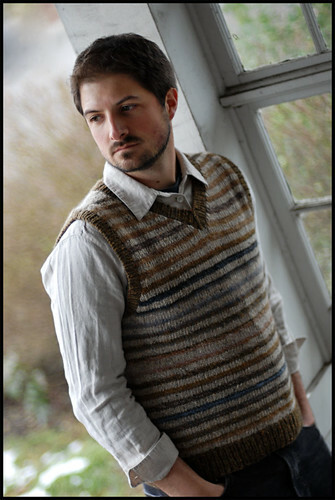 I think I've finally convinced my non-vest wearing husband that he would be the recipient of more handknits if he would just get over it and wear a vest. This just might be his next gift. Oooh, have fun in Florida. I've never been but I hear they have an abundance of sunshine. The vest is fabulous - I just wish the hubby would actually wear a vest (or even have an open mind about one). it is rough to run out of knitting on a trip, but on the other hand ... it gives you a guilt-free reason to go acquire more yarn. Oh, that's great! I love how the stripe colors fade into each other. I love it. very stylish. Wonderful colors! Heh, by folks you mean Linda, right? Love her. Love the vest, too. I've been thinking I really need some vests, since I tend to overheat too easily otherwise. Sending you greetings from the Alberta Hood, Pdx! The vest looks great. Enjoy the sunshine. Thanks for another great future project. I've made your Koolhaus hat and it turned out super. I hope our Florida weather stays nice for you while you're here -- it'll definitely be better than New York. gorgeous, beautiful work as always. you are so talented! is that you modeling the vest? Gorgeous vest! If you head down to Sarasota, do check out the Ca d'Zan (http://en.wikipedia.org/wiki/Ca_d%27Zan). The colors and textures (and Banyan trees!) are well worth the trip. A fantastic place to spend a day. Creep that I am, I was discussing your brilliance to a friend. He recognized your name and it turns out we went to the same university, so hello from Tacoma! What a small small world. Love the vest, by the way! Close Knit is one of my very favorites in Portland. Alberta is eclectic & artistic. Love that you named the vest after such a gem. Beautiful design --- once again. 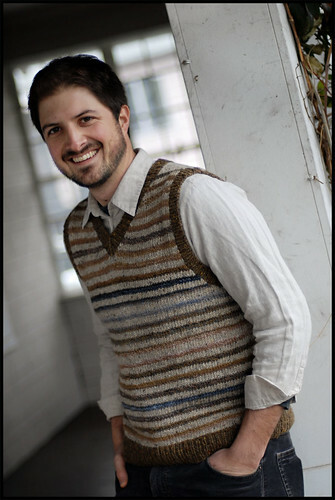 Great vest -- I'd love to play with a solid & a self striping yarn with it. Now I just have to convince one of the men in my life that they are vest wearers! So very beautiful, as always. One more recommendation for Tampa: Go for a nice, long walk on the Bayshore. It is (or was) the longest continuous sidewalk in the country, and it's a lovely thing to do in the morning and evening. It starts near downtown and follows the bay a long, long way. (You can even do a workout along the route if you are so inclined.) Enjoy yourself! The vest is beautiful. Thanks for another great pattern. This is a wonderful way to use up left over yarn! I have a whole bag of left overs from sweaters and hats that would be perfect for this. Thanks for the pattern! I see a new sweater vest for my dad in the future! yes. but doesn't running out of knitting translate to : excuse to go yarn shopping in an exotic local? or is that just my alterior motive? hum. have fun in the sunshine! I love to see your blog! Another perfect project, as always. amazing, i love the colours ! I always treat running out of knitting while on vacation an excuse to hit up a new yarn store for inspiration. Gorgeous! I think my man would wear this! I love the look of this vest. I think I'm going to see how much yarn I have after one of my sweater projects and frankenstein my own out of leftovers. Something about how you created the project just means to me that I shouldn't go out and buy yarn to explicitely make this topper. I'm thrilled that you've written up the pattern. Please advise if the pattern is only available in the magazine. On Ravelry it states that the pattern is available for $6.95 but it doesn't say where! Gorgeous! I love the no-purling! I too panic with the thought of having time to knit with no knitting, especially when far from home on vacation. Happy packing! Have a great time in FL! Enjoy the Sunshine state! Enjoy your trip to Florida! Please don't take this the wrong way, I'm a married woman with two kids, but you are quite handsome! Thanks for brightening my drab February day! That west is soo classy! That would be something for my dad, especially given how much he loves his Noro striped scarf. Too early to even mention xmas knitting but I'll be back for this one! What a handsome vest! I love that it is worked with steeks, too. Off to add this to my Ravelry queue! i live just off alberta and am not surprised you call this area home when in pdx - you have such wonderful taste. love the vest too!!! My knitting teacher gave me the link to your beautiful blog. I've been "lurking" for awhile now and thought I'd tell you how very much I do enjoy your site. It's a lovely think when artistry meets craftsmanship as it has in you. Well done! Jared- OMG- you handsome devil. That is the perfect sweater for handspun. this is gorgeous. will def put this on my to-do-list. have an awesome trip over here in pdx. Jared, after seeing your original post I knit up this version using my leftover cascade 22o yarn. The Alberta district has been my home for the past 11 years. Awesome Vest! FLorida -enjoy! I love it there. Tampa is very pretty! We are actually leaving for Orlando and Tampa on 3/15 till 3/21 - you have a blast. Definately go to the beach and relax. Knitting and all! This is a great vest. The colors are amazing.